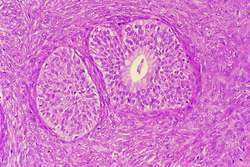 a relatively infrequent benign neoplasm of the ovary, consisting chiefly of fibrous tissue that contains nests of cells resembling transitional type epithelium, as well as glandlike structures that contain mucin; origin is controversial, but it may arise from the Walthard cell rest; ordinarily found incidentally in ovaries removed for other reasons, especially in postmenopausal women. an uncommon benign ovarian neoplasm consisting of nests or cords of epithelial cells containing glycogen that are enclosed in fibrous connective tissue. The tumor may be solid or cystic and is sometimes difficult to distinguish from certain granulosa-theca cell neoplasms. A benign neoplasm of the ovary, consisting chiefly of fibrous tissue that contains nests of cells resembling transitional type epithelium, as well as glandlike structures that contain mucin; origin is controversial, but it may arise from Walthard cell rest; ordinarily found incidentally in ovaries removed for other reasons, especially in postmenopausal women. Brenner tumor - a relatively infrequent benign neoplasm of the ovary. PRECIS: We have investigated the clinical features of rare Brenner tumors with twenty two cases were operated in our clinic. Brenner tumors are a relatively rare surface epithelial neoplasm of the ovary, accounting for 1. Among the patients, only two had clinical symptoms caused by Brenner tumors and these were malignant. The left ovary was involved in 12 cases, the right in 8 cases, and bilateral Brenner tumors existed in 2 cases (9. Some authors indicated that malignant Brenner tumors had better prognosis than other epithelial ovarian tumors (7). Brenner tumors are usually benign neoplasms of the ovary, which are frequently diagnosed incidentally during surgical procedures. Brenner tumors require further intervention trials and studies because of the limited number of trials. Malignant Brenner Tumors of the Ovary and Tumor Markers: Case Reports. Ovarian Brenner tumors and transitional cell carcinoma: recent developments. Brenner tumors of the ovary: sonographic and computed tomographic imaging features. A histogenetic consideration of ovarian mucinous tumors based on an analysis of lesions associated with teratomas or Brenner tumors. Imaging in gynecological disease (7): clinical and ultrasound features of Brenner tumors of the ovary.